The 4 meter ScopeDome is hibernating on its shipment pallet. 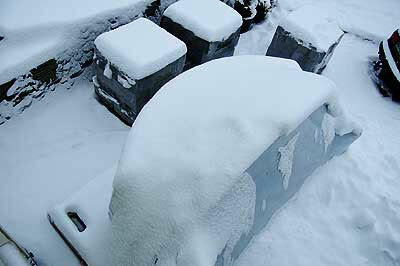 Half of a snowed-down observatory dome snuggles on its pallet beside stacks of cinder blocks. The cinder blocks will form the 3.5 meter diameter cylindrical foundation of the observatory. There are two obstacles along the road to a completed observatory: the weather and the day job. Rain, snow and ice have delayed the foundation work. The construction area is a frozen, 20 centimeter deep pond at the moment. The first milestone on the road to completion is to drain surface water away from the basement rock where the concrete pier of the telescope mount will stand. Deep ground frost is delaying this work. There is too much to do, too many hours go to commuting, and not enough hours in a day.